Colin, a white man, and political activist Joyce Clague met in 1964 and have had a mixed-race marriage that has been entwined in a forty-year journey of support, nurturing, devotion, commitment and love. They are the yin and yang of each other. But it is their principles about Aboriginal welfare, social justice, humanity and family that bind them and have helped shape the Australian nation. When Colin met Joyce is a love story with a true sense of reconciliation bringing Colin's and Joyce's lives together. 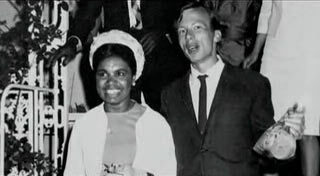 Joyce (left) and Colin in 'When Colin Met Joyce'. When Colin met Joyce was written and produced by Yaegl woman Pauline Clague.